A sovereign state is, in international law, a nonphysical juridical entity that is represented by one centralized government that has sovereignty over a geographic area. International law defines sovereign states as having a permanent population, defined territory, one government, and the capacity to enter into relations with other sovereign states. It is also normally understood that a sovereign state is neither dependent on nor subjected to any other power or state. Sovereignty is a term that is frequently misused. Up until the 19th century, the radicalised concept of a "standard of civilization" was routinely deployed to determine that certain peoples in the world were "uncivilised", and lacking organised societies. That position was reflected and constituted in the notion that their "sovereignty" was either completely lacking, or at least of an inferior character when compared to that of "civilised" people." Lassa Oppenheim said, "There exists perhaps no conception the meaning of which is more controversial than that of sovereignty. It is an indisputable fact that this conception, from the moment when it was introduced into political science until the present day, has never had a meaning which was universally agreed upon." In the opinion of H. V. Evatt of the High Court of Australia, "sovereignty is neither a question of fact, nor a question of law, but a question that does not arise at all." Named after the 1648 Treaty of Westphalia, the Westphalian System of state sovereignty, which according to Bryan Turner is "made a more or less clear separation between religion and state, and recognised the right of princes 'to confessionalise' the state, that is, to determine the religious affiliation of their kingdoms on the pragmatic principle of cuius regio eius religio [whose realm, his religion]." The Westphalian model of state sovereignty has increasingly come under fire from the "non-west" as a system imposed solely by Western Colonialism. What this model did was make religion a subordinate to politics, a problem that has caused some issues in the Islamic world. This system does not fit in the Islamic world because concepts such as "separation of church and state" are not recognised in the Islamic religion as valid. Country denotes a region of land defined by geographical features or political boundaries. The constitutive theory of statehood defines a state as a person of international law if, and only if, it is recognised as sovereign by other states. This theory of recognition was developed in the 19th century. Under it, a state was sovereign if another sovereign state recognised it as such. Because of this, new states could not immediately become part of the international community or be bound by international law, and recognised nations did not have to respect international law in their dealings with them. In 1815, at the Congress of Vienna the Final Act recognised only 39 sovereign states in the European diplomatic system, and as a result it was firmly established that in the future new states would have to be recognised by other states, and that meant in practice recognition by one or more of the great powers. Most sovereign states are states de jure and de facto (i.e., they exist both in law and in reality). However, a state may be recognised only as a de jure state, in that it is recognised as being the legitimate government of a territory over which it has no actual control. For example, during the Second World War, governments-in-exile of a number of continental European states continued to enjoy diplomatic relations with the Allies, notwithstanding that their countries were under Nazi occupation. The PLO and Palestinian Authority claim that the State of Palestine is a sovereign state, a claim which has been recognised by most states, though the territory it claims is under the de facto and "de jure" control of Israel. Other entities may have de facto control over a territory but lack international recognition; these may be considered by the international community to be only de facto states. They are considered de jure states only according to their own law and by states that recognise them. For example, Somaliland is commonly considered to be such a state. For a list of entities that wish to be universally recognised as sovereign states, but do not have complete worldwide diplomatic recognition, see the list of states with limited recognition. "sovereign", The New Oxford American Dictionary (2nd ed. ), Oxford: Oxford University Press, 2005, ISBN 0-19-517077-6, adjective ... [ attrib. ] (of a nation or state) fully independent and determining its own affairs. ↑ Krasner, Stephen D. (1999). Sovereignty: Organised Hypocrisy. Princeton University Press. ISBN 0-691-00711-X. ↑ Núñez, Jorge Emilio (2013). "About the Impossibility of Absolute State Sovereignty". International Journal for the Semiotics of Law. 27 (4): 645. doi:10.1007/s11196-013-9333-x. ↑ Wilde, Ralph (2009). "From Trusteeship to Self-Determination and Back Again: The Role of the Hague Regulations in the Evolution of International Trusteeship, and the Framework of Rights and Duties of Occupying Powers". Loy. L.A. Int'l & Comp. L. Rev. 31: 85–142 [p. 94]. ↑ Akweenda, Sackey (1997). "Sovereignty in cases of Mandated Territories". International law and the protection of Namibia's territorial integrity. Martinus Nijhoff Publishers. p. 40. ISBN 90-411-0412-7. ↑ "Chapter IV Fundamental Rights and Duties of States". Charter of the Organization of American States. Secretariat of The Organization of American States. Retrieved 21 November 2010. ↑ "Draft Declaration on Rights and Duties of States" (PDF). UN Treaty Organization. 1949. Retrieved 21 November 2010. ↑ "General Assembly resolution 1803 (XVII) of 14 December 1962, "Permanent sovereignty over natural resources"". United Nations. Archived from the original on 18 February 2011. Retrieved 21 November 2010. ↑ "International Covenant on Civil and Political Rights". 1 2 Turner, Bryan (July 2007). "Islam, Religious Revival and the Sovereign State". Muslim World. 97 (3): 405–418. 1 2 Hillier, Tim (1998). Sourcebook on Public International Law. Routledge. pp. 201–2. ISBN 1-85941-050-2. ↑ Hersch Lauterpacht (2012). Recognition in International Law. Cambridge University Press. p. 419. ISBN 9781107609433. ↑ "CONVENTION ON RIGHTS AND DUTIES OF STATES". www.oas.org. ↑ Castellino, Joshua (2000). International Law and Self-Determination: The Interplay of the Politics of Territorial Possession With Formulations of Post-Colonial National Identity. Martinus Nijhoff Publishers. p. 77. ISBN 90-411-1409-2. ↑ BBC The President of the International Court of Justice (ICJ) Hisashi Owada (2010): "International law contains no prohibition on declarations of independence." ↑ Oshisanya, An Almanac of Contemporary and Comperative Judicial Restatement, 2016 p.64: The ICJ maintained that ... the issue of recognition was a political. 1 2 Staff writers (20 February 2008). "Palestinians 'may declare state'". BBC News. British Broadcasting Corporation. Retrieved 22 January 2011. :"Saeb Erekat, disagreed arguing that the Palestine Liberation Organisation had already declared independence in 1988. "Now we need real independence, not a declaration. We need real independence by ending the occupation. We are not Kosovo. We are under Israeli occupation and for independence we need to acquire independence". 1 2 B'Tselem - The Israeli Information Center for Human Rights in the Occupied Territories: Israel's control of the airspace and the territorial waters of the Gaza Strip, Retrieved 24 March 2012. 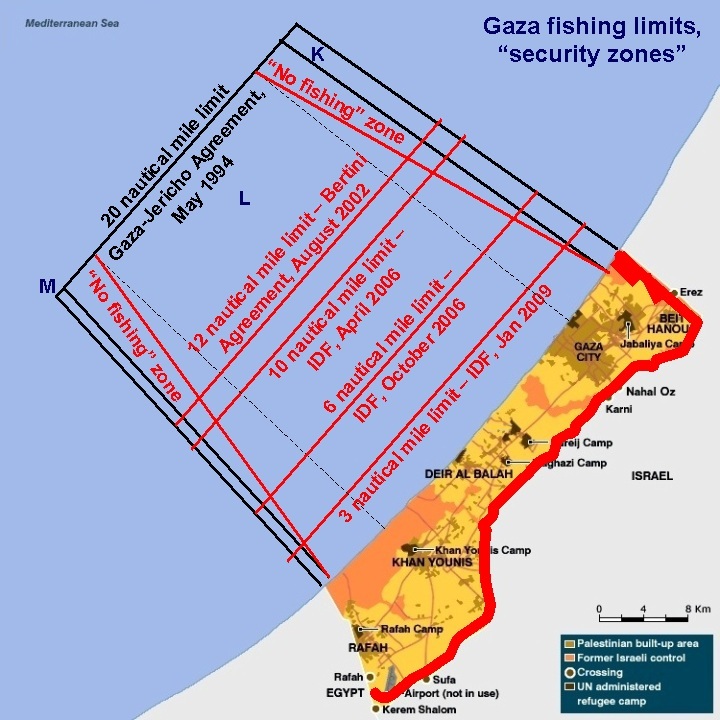 ↑ "Map of Gaza fishing limits, "security zones"". ↑ Israel's Disengagement Plan: Renewing the Peace Process Archived 2 March 2007 at the Wayback Machine. : "Israel will guard the perimeter of the Gaza Strip, continue to control Gaza air space, and continue to patrol the sea off the Gaza coast. ... Israel will continue to maintain its essential military presence to prevent arms smuggling along the border between the Gaza Strip and Egypt (Philadelphi Route), until the security situation and cooperation with Egypt permit an alternative security arrangement." ↑ "Address by Foreign Minister Livni to the 8th Herzliya Conference" (Press release). Ministry of Foreign Affairs of Israel. 22 January 2008. Archived from the original on 26 October 2011. Retrieved 16 July 2010. ↑ Arieff, Alexis (2008). "De facto Statehood? The Strange Case of Somaliland" (PDF). Yale Journal of International Affairs. 3: 60–79. Retrieved 4 January 2010. ↑ "The List: Six Reasons You May Need A New Atlas Soon". Foreign Policy Magazine. July 2007. Retrieved 4 January 2010. ↑ "Overview of De-facto States". Unrepresented Nations and Peoples Organization. July 2008. Retrieved 4 January 2010. ↑ Wiren, Robert (April 2008). "France recognises de facto Somaliland". Les Nouvelles d'Addis Magazine. Retrieved 4 January 2010. ↑ Robinson, E. H. (2013). "The Distinction Between State and Government" (PDF). The Geography Compass. 7 (8): 556–566. 1 2 Crawford, J. (2006). The Creation of States in International Law (2nd ed.). Oxford: Clarendon Press. ISBN 0-19-826002-4. ↑ Robinson, Edward Heath (2010). "An Ontological Analysis of States: Organizations vs. Legal Persons" (PDF). Applied Ontology. 5: 109–125. ↑ Fazal, Tanisha M. (1 April 2004). "State Death in the International System". International Organization. 58 (2): 311–344. doi:10.1017/S0020818304582048. ISSN 1531-5088. ↑ Robinson, Edward Heath (2011). "The Involuntary Extinction of States: An Examination of the Destruction of States though the Application of Military Force by Foreign Powers since the Second World War" (PDF). The Journal of Military Geography. 1: 17–29. ↑ Ringmar, Erik (1996). "On the ontological status of the state". European Journal of International Relations. 2 (4): 439. doi:10.1177/1354066196002004002. 1 2 Robinson, Edward H. (2014). "A documentary theory of states and their existence as quasi-abstract entities" (PDF). Geopolitics. 19 (3): 1–29. doi:10.1080/14650045.2014.913027. Archived from the original (PDF) on 3 March 2016. Retrieved 16 September 2014. ↑ Ringmar, Erik (1996). "On the Ontological Status of the State". European Journal of International Relations. 10 (2). ↑ Schmandt & Steinbicker 1954, p. 71 (citing Hegel's Philosophy of History, trans. J. Sibree [New York: Wiley Book Co., 1934]); see also Hegel, Georg Wilhelm Friedrich (2012) . The Philosophy of History. Courier Corporation. p. 39. ISBN 978-0-486-11900-7. ↑ "The SAGE Handbook of Diplomacy". SAGE Publications. pp. 294–295. Retrieved 17 November 2016. ↑ Fazal, Tanisha M.; Griffiths, Ryan D. (1 March 2014). "Membership Has Its Privileges: The Changing Benefits of Statehood". International Studies Review. 16 (1): 79–106. doi:10.1111/misr.12099. ISSN 1468-2486. ↑ "The State of Secession in International Politics". E-International Relations. Retrieved 16 November 2016. ↑ "The Size of Nations". MIT Press. Retrieved 16 November 2016.